The First Crusade was launched in 1095 by Pope Urban II with the primary goal of responding to the appeal from Byzantine Emperor Alexius I. The Emperor requested that western volunteers come to their aid and repel the Seljuk Turks from Anatolia, modern day Turkey. An additional goal soon became the principal objective - the Christian reconquest of the sacred city of Jerusalem and the Holy Land and the freeing of the Eastern Christians from Islamic rule. 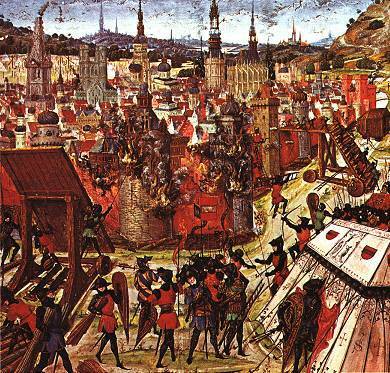 Both knights and peasants from many nations of Western Europe travelled over land and by sea towards Jerusalem and captured the city in July 1099, establishing the Kingdom of Jerusalem, County of Tripoli, the Principality of Antioch and the County of Edessa. Although these gains lasted for less than two hundred years, the First Crusade was part of the Christian response to the Islamic conquests, as well as the first major step towards reopening international trade in the West since the fall of the Western Roman Empire. 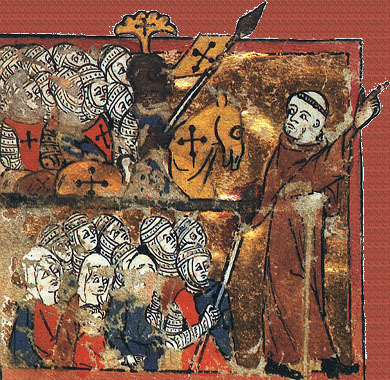 In March 1095 at the Council of Piacenza, ambassadors sent by Byzantine Emperor Alexius I called for help with defending his empire against the Seljuk Turks. Later that year, at the Council of Clermont, Pope Urban II called upon all Christians to join a war against the Turks, promising those who died in the endeavor would receive immediate remission of their sins.